Moog Sub Phatty: well, we're assuming that's what it's called. 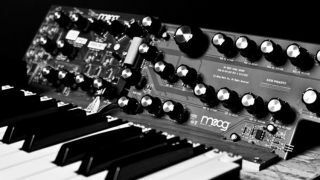 NAMM 2013: Moog has seemingly confirmed that the synth it'll be launching at next week's Winter NAMM show will be called the Sub Phatty. Images posted on the Moog Facebook page clearly feature this name. What's more, what looks like a Moog Sub Phatty advert invite is doing the rounds on the internet. This features a pic of not only the synth's innards, but also its front panel. It also suggests that the Sub Phatty will feature 25 keys, 31 knobs, two oscillators and one sub oscillator. We'll have all the confirmed Sub Phatty details and a video demo next week.